THE UNEMPLOYED EATER: Cava Opening This Week in Culver City AND Venice. Free Lunch Tuesday AND Wednesday. Cava Opening This Week in Culver City AND Venice. Free Lunch Tuesday AND Wednesday. 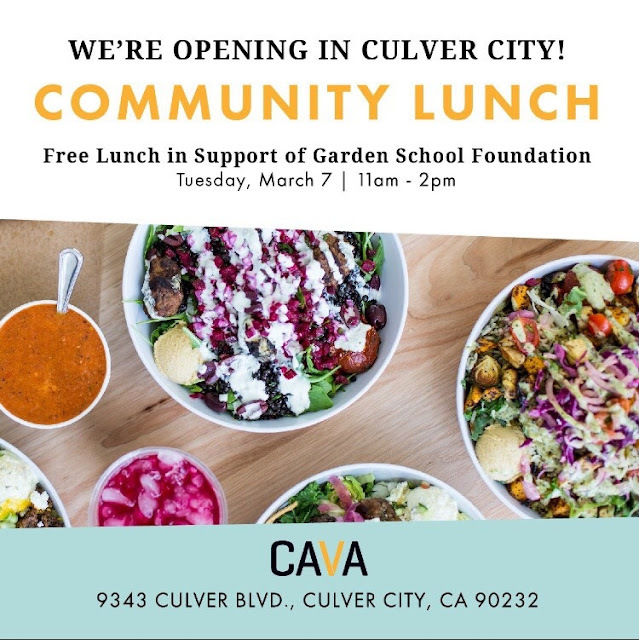 Cava, which may be best described as "a Mediterranean'ish Sweetgreen," like its comparison-sake will be expanding to the westside in a big way this week. The fresh, inventive, fast casual salad-grain bowl-pita concept will open not one, but two western locations. First comes the Culver City spot on Tuesday right in the heart of downtown in the former Native Foods environs; followed by a Venice restaurant on the newly cool Lincoln Blvd on Wednesday. The cherry on top: both will be offering free lunch on their opening days. So you can stop by 9343 Culver Blvd on Tuesday or 320 Lincoln Blvd on Wednesday between 11am-2pm to build your own complimentary salad, grain bowl or pita. (They will, however, be accepting totally voluntary donations to the Garden School Foundation, if you feel so inclined). I've been to events at other places, but this was my first time in here. Great place. Food was good and seating was very comfortable. Also, very good view from where I sat. This is such a cool event space San Francisco and the atmosphere was equally amazing.